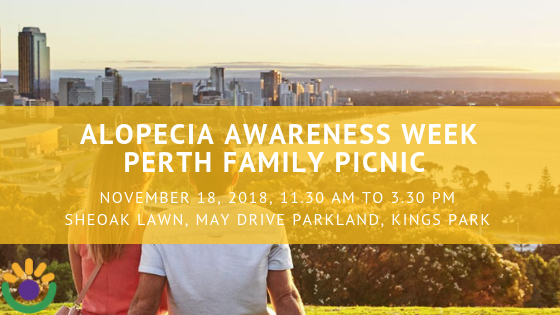 Join us to celebrate Alopecia Awareness Week with a family-friendly event hosted by our WA Alopecia Support Group. Family and friends welcome to join us for a relaxing afternoon next to the dinosaur playground. AAAF will provide sausages and buns (one per person) and a soft drink for the kids. All other food and drinks to be BYO. Be aware that no glass drinkware is allowed in the park so please bring plastic or acrylic wine/drink glasses. Please RSVP to greg@aaaf.org.au by November 8, 2018 with numbers of adults/children attending.